EspañolAt times, societies have used demonstrations and street protests to reject the excesses of government power, to fight for and exercise their individual liberties. Still to this day, demonstrations like these take place; however, the number is on the rise of protests where citizens demand, instead, for a more overbearing and intrusive state. Most recently, Ukraine has offered the perfect example of the first, honorable kind of demonstration. Citizens have taken to the street to reject the decision made by their president, Víctor Yanukóvich, who preferred to align the country with Russia, rebuffing a deeper integration within the European Union. Ukrainians have gathered in the city square to claim their right to economic freedom and reject Russia’s imperialism. 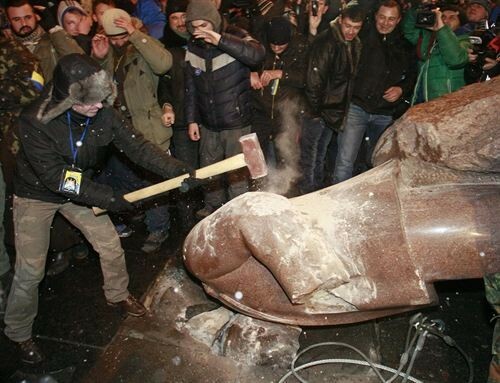 Demonstrators in Kiev tore down Lenin’s statue. These people, who have lived for a long time under a totalitarian regime — guided and protected by the former Soviet Union — are the first ones to appreciate the value of any sign of liberalization in their country. Yanukóvich’s decision is a setback from what Ukrainians have gained since the end of the soviet regime, and that explains why thousands of citizens have decided to make a stand. In other regions, however, demonstrations have served sinister purposes, such as intimidation and the strengthening of populist governments. The most recent example of this kind of protest could be the rallies that took place last week in Bogotá, Colombia. Last week, the nation’s attorney general removed the mayor of Bogotá, Gustavo Petro (explained here). As I anticipated, Colombians rallied and made big demonstrations in support of Petro, glorifying him as a leftist martyr. These demonstrations may be the epitome of statist outreach: these people in Bogotá, afraid of independence, are basically demanding less freedom and more state intervention — corruption be damned. They are not only supported but summoned by the mayor himself, in his attempt to remain in charge, and thousands of people have taken to the streets with the purpose of retaining their ruler. These demonstrations are supported by the state, organized with the state, and in favor of the state — just like in a totalitarian regime. What the infantile yet dangerous demonstrators are defending is a government with a paternalist framework — a model that glorifies class struggle, the nationalization of services (such as the garbage-collection system), and restrictions on individual freedoms (such as the prohibition of bullfights and the bearing of weapons). Unfortunately, without these characteristics, people from Bogotá would not have shown any support for it. The worst part is that these latest demonstrations have not been the only ones taking place in this South American country. In 2013, various groups have protested to defend their own economic largesse, by demanding state-sponsored aid, and restrictions on free trade (e.g. the agricultural sector) and entrepreneurship (e.g. the health sector). Contrary to what has happened with the citizens from Ukraine or other post-soviet states, Colombians are not appreciating what little freedom they have acquired, because they take it for granted. Perhaps this is because the society has chosen mediocrity over meritocracy. Ironically, such restricted liberty plays into the hands of the of privileged sectors and ruling class, at the expense of the citizenry. These circumstances suggest that Colombian citizens, in general, are thrilled with the state as the only resource they need to reach their economic goals and guarantee their material well-being. However, what they have not realized yet is that by rejecting personal responsibility they are creating the perfect equation for material poverty, spiritual distress, and an eventual yearning for freedom that has been seen recently in societies such as the Ukrainian. In the end, what is the purpose of demonstrations? I hope, in a not-so-distant future, they will serve other, superior goals. They will not mirror a society’s biggest mistakes or emerge as a way to reject humanity’s biggest asset — freedom; they will be more than a shortsighted tool for reaching impossible ideals like material security and a perfect society through authoritarian rulers who portray themselves as benevolent leaders. Javier Garay is a professor at the Externado University of Colombia. He has written two books on international issues, such as development, after his doctoral dissertation focused on the same topic. Follow him on Twitter @crittiko and through his personal blog, Crittiko. Honduras’s ZEDEs: Where and When?